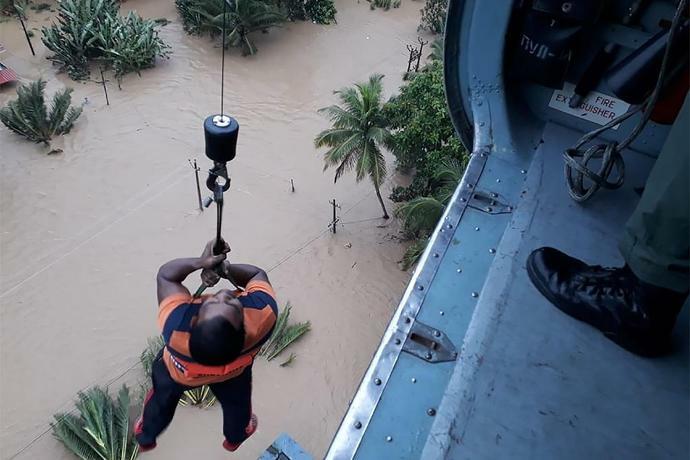 Kochi (India) (AFP) - Rescuers in helicopters and boats fought to get to stranded villages in India's Kerala state Saturday as the toll from the worst monsoon floods in a century rose above 320 dead. Dozens of military and coastguard helicopters flew in torrential rain to reach high risk areas, officials said, with Indian Prime Minister Narendra Modi describing the crisis as "devastating". Kerala chief minister Pinarayi Vijayan announced late Friday that the monsoon death toll had dramatically risen to 324. State officials said they expected the number to rise further as more landslides were reported and as dam and reservoir levels remained dangerously high. With power and communication lines down, thousands remained trapped in towns and villages cut off by the floods amid growing shortages of food and water. 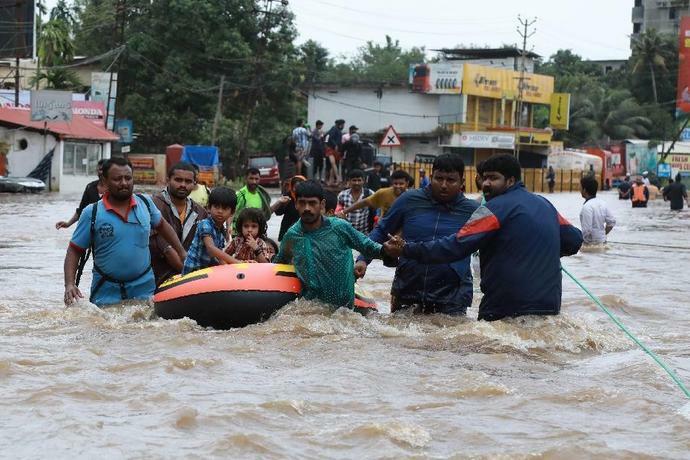 Helicopters have been dropping emergency food and water supplies across Kerala, while special trains carrying drinking water have been sent to the state. Dozens of dam and reservoir gates across the state have had to be opened as water levels reach danger levels, inundating many villages. While more than 300,000 people have taken shelter in relief camps, particular fears have been raised for Chengannur, about 120 kilometers (75 miles) north of the state capital Thiruvananthapuram, which has been cut off for four days. Troops and military boats have been sent to the town and media reports said bodies had been found. The state government did not immediately give an updated toll early Saturday. Saji Cherian, who represents Chengannur in the Kerala assembly, said he feared there were at least 50 dead in the town and broke down in tears as he pleaded for more help on Asianet TV late Friday. "Please give us a helicopter. I am begging you. Please help me, people in my place will die. Please help us. There is no other solution, people have to be airlifted," he said. "We did what we can with fishing boats we procured using our political clout. But we can't do more." With no end in sight to the rains, people all over the state of 33 million have made panic-stricken appeals on social media for help, saying they cannot make contact with rescue services. Some say they are trapped inside temples and hospitals as well as submerged homes. Authorities have warned that rains and strong winds are predicted for many parts of Kerala on Saturday and Sunday. Prime Minister Modi arrived in Kerala on Friday night and held meetings with state leaders and went on a brief air inspection tour. "I took stock of the situation arising in the wake of the devastating floods across the state," Modi said in a Twitter statement. He added that the government "is providing all possible assistance to Kerala. This includes financial assistance, providing food grains and medicines." An immediate grant of about $75 million would be given to the state. 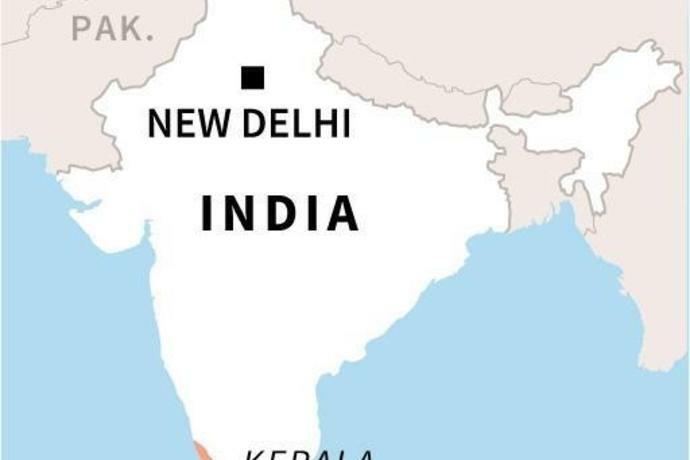 Dozens of military helicopters stepped up rescue operations across the state and in one a heavily pregnant woman Sajita Jabeel, 25, gave birth just after her rescue, an Indian Navy spokesman said. "It was a very critical case, the lady was in labour, her water had broken," the pilot, the pilot Commandeer Vijay Verma told News18 television. "We took a doctor along, we winched her up, it took some time though because we had to winch down two people to help her get on to the strop." Another pilot, Captain P. Rajkumar, winched 26 people up from a rooftop after guiding the helicopter through trees and other houses. A video of his Sea King pulling up the victims has been widely shared on social media. He ended up with 32 people in his Sea King helicopter. Rajkumar was given the Shaurya Chakra medal for bravery this week after lifting a fisherman from the sea when cyclone Ockhi hit India last year. MUMBAI/NEW DELHI (Reuters) - Embattled Jet Airways halted all flight operations indefinitely on Wednesday after its lenders rejected its plea for emergency funds, potentially bringing the curtains down on what was once India's largest private airline. "The airline has been left with no other choice today but to go ahead with a temporary suspension of flight operations," the company said in a two-page statement late on Wednesday. The airline, which has roughly 16,000 employees, has in recent weeks been forced to cancel hundreds of flights and to halt all flights out of India, as funds have dried up. While the government cites payroll data to claim significant job creation, the opposition holds up a leaked preliminary report that pegged unemployment in 2017 at 6.1 percent, which if true would be the highest rate in 45 years. It might be more useful instead to concentrate on the most recent numbers we can all agree on, which come from a government survey of over 150,000 households across India between April and December of 2015. The data suggest that, at least in 2016, unemployment hovered around 5 percent. The Indian government on Tuesday ordered tech giants Google and Apple to take down the Chinese-owned Tiktok video app after a court expressed concerns over the spread of pornographic material, sources told AFP. Tiktok has already been banned in neighbouring Bangladesh and hit with an enormous fine in the United States for illegally collecting information from children. The app, which claims to have 500 million users worldwide with more than 120 million in India, has been fighting the effort to shut it down after a high court in Chennai called for the ban on April 3. India's election commission on Monday banned a Hindu state chief minister from campaigning for three days after anti-Muslim comments in an election that will end next month. The saffron-clad Yogi Adityanath, a member of Prime Minister Narendra Modi's ruling party, had been warned this month about his campaign speeches, the election commission said. The commission said Adityanath, chief minister of Uttar Pradesh, had spoken about a "green virus" in a speech last week in reference to Muslim voters who he said were being wooed by opposition parties. The 2019 Mazda CX-5 Diesel Is Finally Here-but Is It Impressive Enough? Robert Mueller report will be a gold mine of improprieties. Trump shouldn&apos;t celebrate yet. To subscribe to our email news, simply send us your email address using the form below. You will receive emails from the DailyMagazine.News alerting you to major breaking news stories.